Minor’s proudly presents the 2018 Flavor ExpeditionTM to celebrate the commercially ambitious. Those with a heart for distinctive flavor and craftsmanship, who believe in uncompromised creativity. 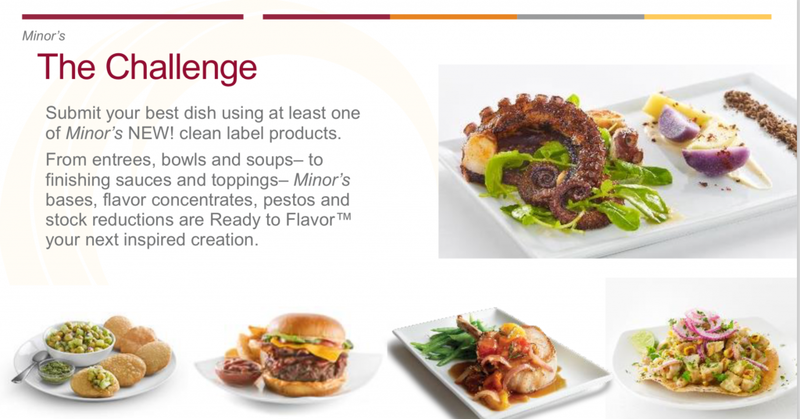 From entrées, bowls, and soups—to finishing sauces and toppings—Minor’s bases, flavor concentrates, pestos and stock reductions are Ready to Flavor your next inspired creation. Craft your own creative recipe using at least one Minor’s® base, sauce or concentrate from the list of eligible products and you could win a trip to the Bocuse d’Or in Lyon, France plus $10,000! To enter, submit your original recipe featuring at least one (1) qualifying Minor’s base, sauce or concentrate from the list of eligible products. Recipe must include a list of all required ingredients (including the Minor’s® product(s) from the list of eligible products above) in specific, common U.S. household measurement units, step-by-step preparation instructions, and cooking temperatures and times. Recipes may not include ingredients with limited availability or that are otherwise cost-prohibitive for use in a foodservice operation. ‡Made with natural ingredients except turmeric and annatto for color. Minimally processed. No artificial ingredients. Complete the entry form and submit your original recipe. Entry period ends August 31, 2018. Subject to Official Rules. All three winners will be announced on flavormeansbusiness.com/flavorexpedition with posted recipes in November 2018.